The next day we were at sea all day, but no one was bored. That doesn’t happen on a Princess Cruise unless a person refuses to come out of his or her cabin. During the at sea days, there were movies, shows, demonstrations, and dance lessons. Some people hung out in the casino while others sat or walked on the Promenade Deck. Others opted to watch a movie on the top deck while sitting in a hot tub or huddled beneath a blanket in a deck chair. Some people shopped and others frequented the bar. Always, there was something to do, to enjoy. There was even a library! On the morning of the last day of the cruise, we attended a demonstration by the sous chef and bakery chef. Quite entertaining. Towards the end of the performance, many of the staff walked on stage, and one of them, a Vietnamese man, regaled us with the most powerful rendition of “Time to Say Good-Bye” I’ve ever heard. Small in stature, his voice was “big” and touched everyone in attendance. At that moment we realized that the hour to say good-bye was quickly approaching. In less than twenty-four hours, all passengers would be disembarking. I spent the afternoon walking on the Promenade deck as the ship eased its way to and through the Inside Passage into Canada. The ship’s naturalist was aboard and kept the passengers abreast of everything going on around us as we slowly cruised into Canadian territory. Whales, porpoises, tree-covered mountains, islands, and glaciers surrounded the ship with their natural beauty. That night we dined with a three other couples whom we had not yet met. Although I can’t recall their names, we sincerely enjoyed their company. They, especially the women, were high-spirited and fun, and I even picked up an excellent recipe for cooking salmon on the grill. And lest I forget, a highlight of the evening was tasting Baked Alaska, a flaming treat that we had seen entering the dining room on trays carried by what seemed to be two dozen staff members. Early the following morning, we put our bags outside of the cabin and made our to the Horizon Dining Room on the 14th deck. We had enjoyed breakfast there several mornings, and the variety and quality of the food were excellent. Usually a bagel and cream cheese gal, my cruise breakfasts were a little more substantial. Let’s just say I added a little something extra. Something like yogurt, fruit, wheat toast, banana nut bread, scrambled eggs, and bacon (only once, don’t judge). And then there was that morning when I opted for salmon and eggs…delicious. Breakfast behind us, we reluctantly walked outside to the Lido Deck and asked a staff member to take our picture. It was time to say good-bye. Jeanita and Thomas were flying out of Vancouver with some other people that evening, and and Judy, Carl, Otis and I were spending the night in Vancouver. Our plan was to take the ferry to Victoria for dinner, but those plans didn’t quite materialize. We took the ferry but went to Sydney, a picturesque coastal town a few miles from where the ferry docked. We walked, oohed and aahed, took pictures, and ate dinner at Subway (they’re everywhere!) before returning to the ferry. The next morning we flew out of Canada towards the home of the brave and the land of the free. 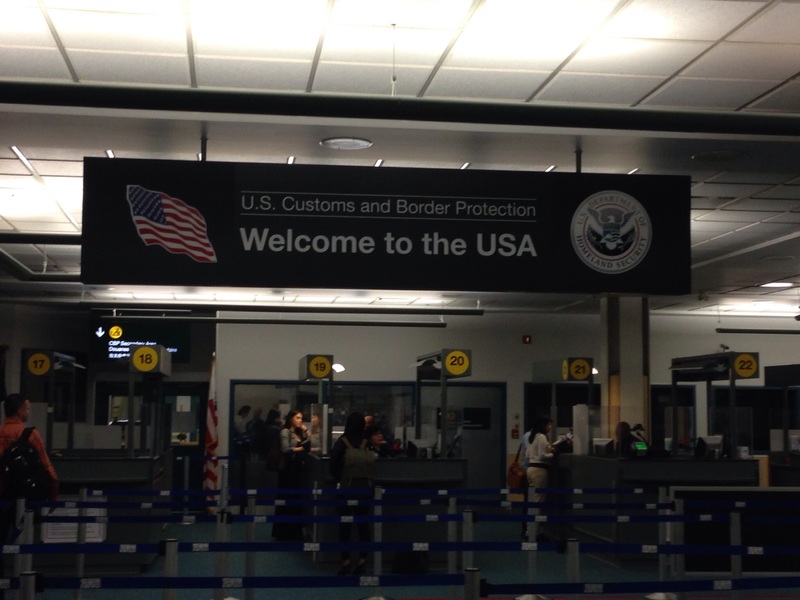 Seeing the words “Welcome to the U.S.A.” was emotional, and I pondered how people entering for the first time must feel. Ketchikan, a word I’d heard quite often in the past several weeks. The very sound of it sounded mysterious and conjured up images of trappers, fishermen, and furriers. Named after the creek that runs through the city, it’s the southeasternmost city in Alaska. It’s also known as Salmon Capital of the World. When we realized that this city would be the last one we’d visit before heading to Canada, we decided to sign up for an excursion. Jeanita and I chose one that allowed us to visit the Saxman Totem Village, and the others opted for a lumberjack competition. Following the lecture, we looked at some souvenirs in another room and then followed a path through the woods to the clan house. Once inside, we observed a traditional dance performed by Tlingits, including two little children, who like their elders, were garbed in native dress. How rich their culture is, I thought. The smallest child was probably around three years old, and I couldn’t help but contrast her daily experiences with the tots I knew. Not that one’s lifestyle was superior to another, but rather that each had a culture, albeit quite different from each other. After leaving the village and arriving back in Ketchikan, Jeanita and I met our husbands for lunch at Annabelle’s. It was an “interesting” experience. Leaving the restaurant, we took a left and headed to Creek Street, a wooden boardwalk in what was once a red light district. We even spotted a sign with a directional arrow pointing to “Married Man’s Trail.” Today the boardwalk is lined with restaurants, shops, and art galleries. The menfolk soon tired of browsing and left for the ship. Jeanita and I found it absolutely necessary, however, to get online and do some work so we found Polar Treats, a combination ice cream/coffee shop, and settled in for about an hour. To be honest, we had been hankering to visit Sweet Mermaids, but as soon as we walked through the door, one of the employees let us know that they were closing at 4:00. It was 3:55. We took a quick look around at the creative artwork, sighed with regret that we hadn’t arrived earlier, and took off in search of Polar Treats. Our work complete, we walked briskly back to the ship, passing the Tongass Trading Company on the way. “Want to stop in for a quick look?” I asked Jeanita. “It’s 5:20,” she said, grinning, and I knew what she was saying. Our curfew was 5:30, and we both knew it would be impossible for us to do justice to the huge store. “Maybe next time,” I replied, knowing that we’d probably never visit this spot again. We were sad to be ending our last shore excursion but glad we had made it happen. Good-bye Annabelle’s. So long Creek Street. Farewell to the Tlingit people of Saxman Village. By this point in our trip to Alaska, I realized that many of our co-travelers were going on expensive excursions and seeing things we were missing out on. We considered signing up for the Best of Juneau excursion that offered at least three fun experiences, but we were too stingy to spend an extra $400+ dollars. Besides, there were things I wanted to do in Juneau that didn’t involve salmon or whales. The day in Juneau began pretty much like the Skagway morning had. We hustled down the gangway like kids let out of school. When we reached the main drag, there was jewelry store after jewelry store, all of them proclaiming to have the most beautiful and reasonably priced gems, gold, and silver. Since ours was the last tour for the season, their prices had been reduced. Already having more jewelry than I could wear, I sauntered in and out of a few shops to browse for souvenirs for the girls on my list. Most businesses were giving away a free gift, and I ended up with two charms, a turquoise bear and an onyx whale’s tale. We bought Northern lights pendants and earrings for the daughters, daughters-in-law, and granddaughters on our list. Except for Otis and me, the rest of our party went back to the ship. Determined to explore the city, I set out for a walking tour while my husband hung around the harbor checking out the sights and sounds. After telling him exactly where I’d be going and when I’d return, I took off up the hill to the left. A few blocks later, I came across the State Office Building and the Alaska State Museum, both of which were closed. Disappointed but undeterred, I continued climbing until I spotted the Governor’s Mansion, a big white Southern Plantation-looking house. The juxtaposition of the colorful totem on the side of the white mansion was, well, interesting. Another noteworthy detail was how close the mansion was to the street. There were no barriers between Sarah Palin’s former residence and her neighbors. What was to prevent people like me, curious tourists, from coming onto the lawn for a photo op? The yard, incidentally, was average, kind of on the small side. The governor’s family could stand on the front porch and have a conversation with the neighbors! Leaving the Governor’s neighborhood, I walked over a few blocks for a glimpse of several churches, including a Russian Orthodox Church, St. Nicholas, that I’d read about in a brochure. I then climbed what seemed like 150 steps of an outside staircase until I arrived at the Wickersham House, the home of a well-known judge who, among other things, was instrumental in the creation of Denali National Park. On the way back down to the main thoroughfare, I saw an arresting site, a single chair placed on what appeared to be wooden planks. A closer look revealed a plaque entitled The Empty Chair, and a little research revealed its significance. In 1942, the United States forced many Japanese people into internment camps, one of whom was a young man named John Tanaka. Valedictorian of Juneau High School that year, he didn’t get to graduate with his class. A bronze replica of the folding chair like the one Tanaka was unable to occupy at graduation was later placed on this Juneau hill to represent this young man and 50+ others who were sent to interment camps. Sobered by the history lesson, I turned and began the descent into the busy shopping area. From atop the hill, I could see water, ships in the harbor, and a bustling downtown. The hilltop seemed the perfect spot to honor those interned in camps so many decades prior. Before leaving Juneau, we bought some hot chocolate from a kiosk and sat sipping and watching the tourists and townspeople walking briskly by us. Reluctant to leave, we finally rose and ambled into the Alaska Fudge Company for a tiny wedge of fudge. On the way out (just couldn’t see to tear ourselves away) we walked into a specialty shop, one that claimed to have unique Alaskan wares, and I left with a small Nativity scene with Baby Jesus and his parents in Eskimo garb. That night at dinner we compared notes of our day over yet another delicious meal, this one including raspberry sorbet served to cleanse our palates and an extra plate of pistachio cookies—just because. Somewhere there’s a small picturesque town in Alaska called Skagway where six of us, all South Carolinians, spent a few memorable hours. We knew it was going to be a fun day as we stood waiting on the deck. As we studied the mysterious graffiti on a huge rock across the way and then glanced at the town villages to our left, we practically bristled with excitement and impatience. Finally the disembarkment began, and beneath an overcast sky, we walked down the gangplank and strode toward the town. A small shuttle bus took several passengers to the downtown area, but most of us chose to take the coastal trail so that we could get a better look at the ships in the harbor and some of the local scenery. Six of us began the excursion together, but the cold and wind began to aggravate Judy’s oncoming cold, so she and her husband Carl left shortly after arrival. My friend Jeanita and I enjoyed browsing through the shops along Main Street, including a fur shop where she spied a coat like one she had purchased years ago. The town (at least the area where we were) was neat, clean, and pretty. Businesses were all well-maintained, and it was a pleasure to walk up and down the main drag and a few blocks off to the side where the homes were. “Can you imagine living in a place like this?” I asked Jeanita. “I know, I know. And then right around the corner, there’s the water,” I said, walking into yet another store. There were jewelry stores, souvenir shops, and even a museum. Attracted by its façade, we went into the museum/gift shop. Dark and a little musty, it was unique in size and interesting. It was probably the smallest museum I’ve ever visited, and yet it contained a treasure trove of artifacts and gold rush memorabilia. We browsed through the building and left with jade bracelets and matching earrings. We’ve never been able to pass up a deal, and the jade combo was no exception—buy the bracelet and get the earrings free. We sauntered into a bakery and vowed to come back for muffins. We didn’t. Not really a regret. Just a fact. You can’t do everything and eat everything. Time and the human digestive system won’t allow it. We went into several jewelry and souvenir shops. Although the businesses were technically souvenir shops, they had a different feel about them, especially the one with native art and jewelry. Our husbands had walked apart from us most of the day, laughing and talking about who knows what. Near lunchtime, the four of rendezvoused at the Red Onion Saloon. In its heyday, the business operated as one of the finest dance halls and saloons in the gold rush town of Skagway. It was also a bordello, and today visitors can tour the rooms upstairs for a small fee. Diners from the various cruise ships filled the tables, and we four sat near the front, a location affording good views of the outside street action and of the restaurant goings-on. The servers all wore dresses with low-cut, form-fitting bodices. In keeping with the spirit of the bordello past, the girls had money stuffed in the front of their dresses. We enjoyed the upbeat ambience of the place and agreed that our chowder and chili dishes were quite tasty. We talked to our server, and when Thomas, Jeanita’s husband, asked her what she was going to do when the ships left, she simply said, “Relax.” She then turned to us and said that actually she was somewhat of an artist and that she made Christmas ornaments of twigs. When she described the ornaments in detail, I recalled seeing them in a gift shop for the price of $44. 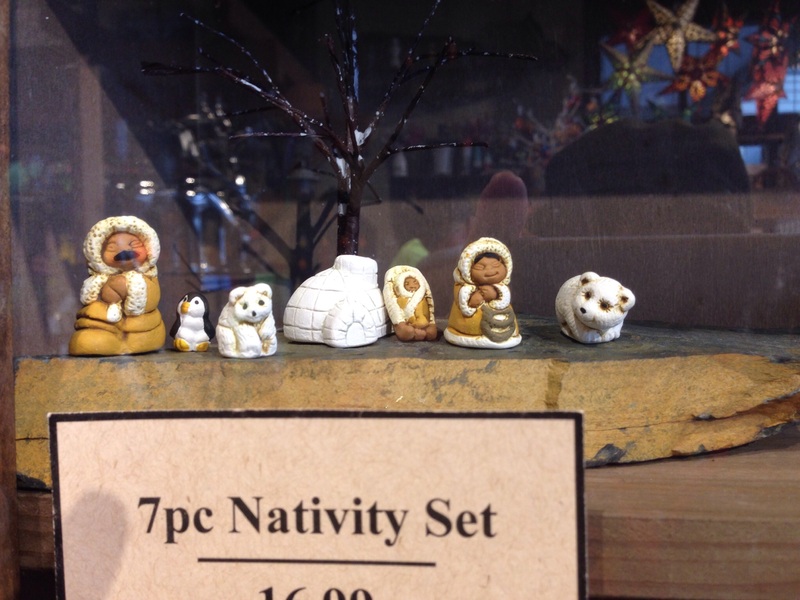 Artistic or not, the tiny twig tree was too pricey for me. Reluctant to leave a place with so much charm and beauty, we stopped by the souvenir shop on the way out. Purchases in hand, we rounded the curve leaving town and walked briskly back to the ship in the chilly, damp air. My last post ended with the anticipation of the bus ride through the Whittier Tunnel, the only passageway between us and the Coral Princess. Like it or not, we had no choice but to go through it no matter how intimated we might feel. Sitting still as statues, the other passengers and I looked straight ahead throughout the entire two and one half miles. If anyone spoke at all, it was in whispered tones, but for the most part, we were quiet, our eyes straining for a glimpse of light at the end. I almost laughed with relief when I finally saw the light. The bus emerged from the tunnel and took a curving road to the left. 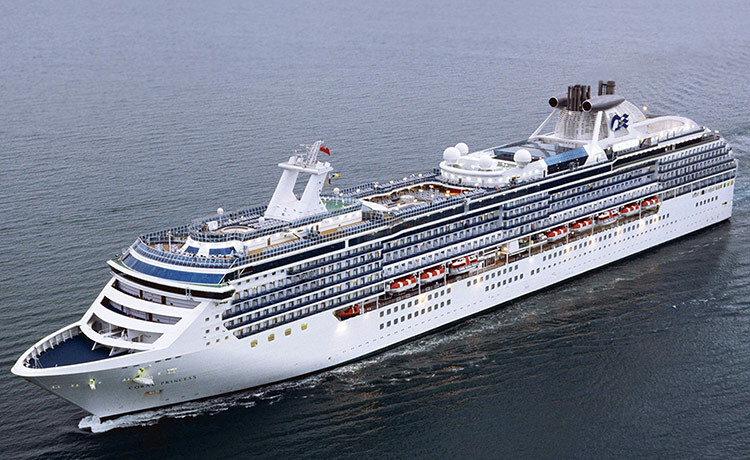 There she sat in the harbor, the Coral Princess. As the driver parked the bus, I looked to the mountains to my right and saw what appeared to be apartments. Later, the woman checked our passports told me that’s where most of the town’s residents resided. Most of the time, she said, that was about 200 people. Now, however, approximately 400 people lived there, many of whom would leave after the last tour of the season: ours. The baggage handling was a snap and was efficiently taken care of by Princess employees. The passengers stood in line for about twenty minutes, and then we were out the door and walking up the gangplank. Once inside the ship, I noticed a man to our left taking pictures of all who came aboard, including us. We gave him tired smiles and then went in search of our room on the Baja Deck, Room 626. That evening, we had dinner in the Bayou Café, and our primary server was a delightful young woman from Macedonia. Pleasant and outgoing, her most frequent expression was an Italian one: “Mama Mia!” She and her two assistants made our first dining experience one to remember. Very attentive, they made certain everything was just right. The menu was extensive, and although two of us ate salmon (after all, we were in Alaska), the others of our party sampled a variety of entrees. One of the men at our table enjoyed his shrimp cocktail so much that he ordered two. After all, he reasoned, we had paid for everything ahead of time. Not even the most disciplined among us could resist dessert. From tiramisu to shortbread and tarts to mousse, there was something delectable to suit even the pickiest of palates. As we walked back to our cabins, we chatted about what the following day would bring. We knew we’d be at sea throughout the night, and much of our conversation revolved around the anticipation of that experience. About that time, we heard a loudspeaker reminding everyone to report to a “muster station” to learn what to do in case of an emergency. The muster station experience brought reality home: You are traveling on a huge ship with hundreds of other people. Look around you! If something goes wrong, these are the people you’ll be sinking with! Author jayne bowersPosted on October 25, 2015 October 25, 2015 Categories Alaska, Alaska tours, princess cruises, travel, traveling, Uncategorized, Whittier tunnelTags Alaska, Princess cruises, tourism, travel, Whittier TunnelLeave a comment on All Aboard! My last post about our Alaska cruise was about leaving Anchorage and heading for Whittier where we’d get on the Coral Princess. On the way, we stopped a a nature preserve and gazed at some magnificent animals. The weather was cold, yet perfect for the fall afternoon. We’d left Anchorage about 8:30 that morning and were scheduled to board the Princess Coral sometime that afternoon. None of us actually knew exactly where that was or when the “all aboard” would take place. We just knew it was soon, and it seemed to me that the whole bus was bristling with excitement and a touch of anxiety. Seven days on a ship? Were we ready? The driver took us through some beautiful country, and I spied a couple of signs pointing toward the Portage Glacier. It would have been divine if we’d had time to visit the glacier that my daughter Carrie and some friends from South Carolina had visited nearly twenty years ago when we were in Anchorage for a Team-in-Training marathon. I recalled the quote, “Don’t be sad it’s over; just be glad it happened.” The memory of that cool morning (although it was June 20) would stay in my mind forever. Suddenly the bus pulled off the road to the right so that we could get a good look at a mountain with a glacier. Many were content to sit tight in the bus, but Otis, Thomas, and I got off to get a better look. We simply could not resist walking through the open space between the evergreens. ‘Twas swell to feel the wind and stand as tall as humans could stand there in that majestic place. A glacier and a mountain and trees and a body of water! Browning’s words, “God’s in His heaven. All’s right with the world” flashed through my mind as we sauntered down near the water. No matter where my life went after the trip, I’d always have this moment in nature with my sweet husband and one of our friends. Even they, tough nature guys, were affected by the magic. We asked Thomas to snap our picture, and the image portrayed our feelings on the last stop before arriving at Whittier. Carpe diem! We got back on the bus with our fellow passengers, and the driver informed us that we had to be at the tunnel by 1:30. The tunnel? What kind of tunnel was so special that you had to have an appointment? Here’s what kind: a 2.5 mile, one-way tunnel dynamited into being! 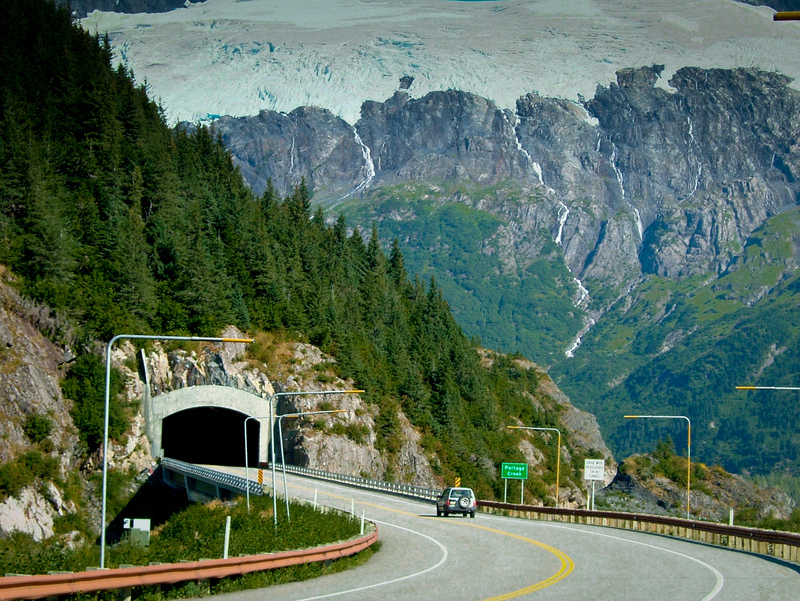 Vehicles leaving Whittier began the trip through the tunnel at the top of each hour, and those going to Whittier went through on the half-hour. That’d be us. It could have been my imagination, but it seemed to be that the chatter stopped, and for the most part, my traveling companions were all silent as they (we) considered what was ahead. We arrived at the tunnel, and I was surprised to see so many cars, trucks, and buses. Where did all those people come from? We took our place in the queue and listened to the driver prattle on as we waited our turn. The half hour was upon us, and the bus inched forward. I’m going to remember these moments for the rest of my life, I thought as I finished my last walk in McKinley National Park. Around midmorning we left on the bus and headed for a little town called Talkeetna where we were scheduled to catch a train to Anchorage. The station was tiny, but it had a beautiful red, white, and blue flag hanging from the front of it. Colorful against the gray sky, it begged for attention, and I obliged by taking a picture of the stars and stripes. The train ride was long, but nice…exciting too. Mile after mile after mile, the train sped through the wild, and we soaked in as much beauty as our human eyes would allow. Many travelers ate lunch, but most settled for snacks. According to fellow passengers, the food choices were fairly extensive, and the service was good. The scenery was breathtaking. Trees, especially the tall, straight pines and yellow willows flew by on every side. There were rivers and gravel bars and hills—everything but people. Occasionally, we glimpsed some small structures, probably work-related buildings, but no houses. How do people travel about in this wild country? I wondered. After a couple of hours, probably closer to three, the conductor announced that soon we’d go through Wasilla, the childhood home of Sarah Palin, and arrive in Anchorage shortly afterwards. Soon we slowed down to ease through an overcast and chilly Wasilla, and he pointed out Palin’s home on our left. The house was nice but unpretentious, and I wondered about her childhood and how the geography and landscape had affected her psyche. Palin lives in Arizona now, a totally different environment. Now she sees desert sagebrush instead of taiga forest, sun instead of misty fog. She never has to worry about permafrost or grizzlies these days, and she can probably leave her coat and gloves behind even on the coldest of winter days. Without ever having met her, I know that as beautiful as Arizona is, there are days when SP misses her native state. There were stores, restaurants, and homes along the way, and I realized that in Wasilla, the citizens had everything we have in Camden—everything necessary for survival, that is. I didn’t spy any oaks, dogwoods, or palmettos, but there were schools, churches, and grocery stores evident all along the ride. When the Princess train pulled into the station, everything around us looked gray: the sky, the concrete, the busses—everything. Like good soldiers, we disembarked from the train and climbed aboard a bus that would transport us into our hotel in Anchorage, the Captain Cook. After freshening up a tad, many travelers, including us, ate dinner in one of the hotel restaurants, Fletcher’s. The food was delicious, and our conversation was not only about our afternoon train experiences but also about the next day’s agenda. Tonight would be the last night we’d spend on land, and by that same hour the next day, we’d be on the ship waiting to set sail. Our time in Anchorage was brief, and if my husband hadn’t been willing to walk to a small diner for breakfast the next morning, our only real contact with the largest of Alaska’s cities would have been too negligible to even count—kind of like having a short layover in Reno and announcing to friends that you had once visited that gambling mecca. As it was, we sauntered down 5th Avenue for a view of the coastline and a short stroll along the Tony Knowles Coastal Trail. After walking back up the steep hill, we walked a few blocks until we found the perfect diner, one that served both locals and tourists alike. The service was good, the food was tasty, and the view of downtown Anchorage through the huge front windows was great. Scuttling back up the street, we made it back to the Captain Cook just minutes before the bus arrived, the one that would take us out of Anchorage and towards the sea and our ship. mom's musings Blog at WordPress.com.